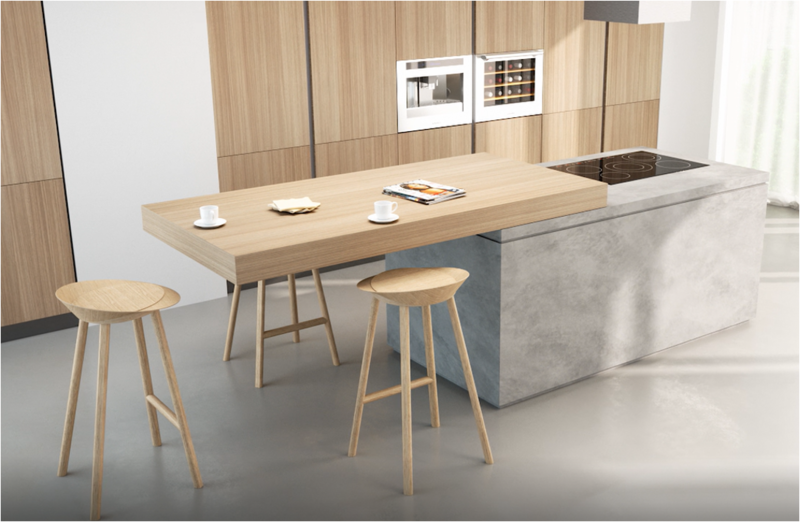 BREAKFAST TOP allows for a kitchen worktop / kitchen countertop to be installed on a sliding mechanism which allows the worktop be extended out to create a kitchen table / breakfast bar. There are a wide choice of sizes available. This listing is for the standard manual operation system, we also list an electronic, automated version which is operated via remote control. All these transformables utilise an ingenious frame design and have been developed to maximise space saving in smaller areas, or where a clutter free environment is required. Designed to sit neatly hidden away behind a drawer front, this system simply pulls out and gives you a choice of table widths. All you need to add is the top of your choice and then you have a versatile tabletop, perfect for small kitchens, kitchenettes, laundry rooms, offices, playrooms and children's bedrooms. Recent applications have also included mobile homes and caravans. Hi The size of my breakfast bar is 2000x900 - would this be suitable? Also is the price for just the brackets/mechanism? If so is there a particular type of worktop that should be placed onto this? Would any of your systems be suitable for a worktop at 500Wx2000L ? Hi Ian, I'm afraid as standard all the sliding worktop systems are designed to work on wider worktops, starting at around 800mm as a minimum. Custom frames can be made to order however if one could be made for your work top please note the custom units are subject to higher unit costs and long lead times. Some of the pull out table frames would fit in a 500mm width but not sure if they would be suitable / applicable for your application? If you do have any other questions or wish to discuss a custom unit in more detail please contact us - websales@box15.co.uk / 01295 565001 Kind Regards, BOX15 Sales Team.